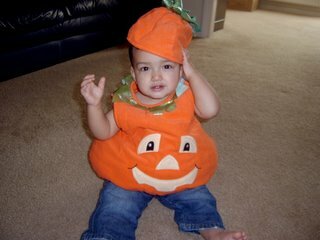 Here's my little pumpkin, isn't he cute? That little hat lasted all of two seconds. And he wasn't too impressed with the whole outfit in general. The other picture I have is of him crying once I'd put it on. I think all that pumpkin padding may have affected his balance as well, because he's been tipping over all day. We went to our mother and baby group today. It clearly said 'Halloween party' on our schedule leaflet. We get there, and if there weren't three paper cut outs of pumpkins on the wall, I wouldn't have been able to tell it was a Halloween party. We were the only ones there who'd gotten dressed up. Luckily, I'd forgotten the rest of my costume at home, otherwise I'd have been really embarassed. I can't wait for tonight - I wonder if this a neighbourhood where there'll be trick-or-treaters. I love Halloween in America, it's nothing like here. Every year, no matter what, my dad would yell really loudly 'WHAT DO YOU WANT?' at the first person who rang the bell, and every year there would be some poor little 5 year old first-time trick-or-treater crying at the end of our lawn. Even if I'd tell him far in advance that the first trick-or-treaters are always small children, he'd never learn his lesson. Ha, I laughed at what you said your dad did. Sounds like something mine would have done if he lived over here. I can't wait to see the picture of your little pumpkin. I started my Halloween post days ago and still can't finish. Maybe tonight! He is so cute, Alanna was a pumpkin too. How adorable! You gotta make it his idea to wear the hat. LOL...your dad scaring those trick or treaters! I know, shame on him, he should have had a measuring stick to figure out who to yell at.